Singapore, officially the Republic of Singapore ( Malay: 'Republik Singapura'; Chinese: 新加坡共和国, Pinyin: Xīnjiāpō Gònghéguó; Tamil: சிங்கப்பூர் குடியரசு, Ciŋkappūr Kudiyarasu), is an island country and the smallest country in South-East Asia. It is located on the southern tip of the Malay Peninsula, south of the Malaysian state of Johor, and north of the Indonesian Riau Islands. It lies 137 kilometres (85 miles) north of the Equator. The site of several ancient port cities and a possession of several empires in its history, Singapore was a Malay fishing village when it was colonised by the United Kingdom in the 19th century. It was further occupied by the Japanese Empire in World War II, and was later part of the merger which established Malaysia. When Singapore acquired independence, having few natural resources, it was sociopolitically volatile and economically undeveloped. Foreign investment and rapid government-led industrialisation has since created an economy which relies on exports of electronics and manufacturing primarily from its port. According to the quality-of-life index assembled by the Economist Intelligence Unit, Singapore has the highest standard of living in Asia, and is ranked 11th in the World. In the more well-known Human Development Index by the United Nations, Singapore holds the 25th place, behind only Japan and Hong Kong in Asia. Measured by GDP per capita, Singapore is the 22nd wealthiest country. The geographically small nation has a foreign reserve of S$197b (US$119b). The name Singapore is derived from the Malay words singa (lion) and pura (city), which were themselves derived from the Sanskrit words सिंह siṃha and पुर pura. In Tamil, one of the official languages of Singapore, Singam means Lion and Puram means City. 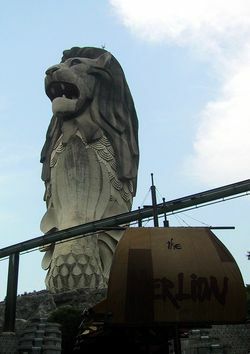 Hence, Singapore is also known as the Lion City. The naming is attributed to a prince named Sang Nila Utama, who according to folklore, was caught in a terrible storm that did not cease until he had thrown his crown into the water. The waters calmed immediately after that, and he sailed to the closest island he could see. The first animal he saw after he had set foot on the island was supposedly a lion. Therefore, he decided to name the island Singapura. The first records of Singapore's existence are in Chinese texts from the 3rd century AD. The island was an outpost of the Sumatran Srivijaya empire and originally bore the Javanese name Temasek (which means sea town). Temasek (Tumasek) rose to become a significant trading city, but subsequently declined. There are few remnants of old Temasek in Singapore, but archaeologists in Singapore have uncovered evidence of the civilization, as well as other settlements. Between the 16th and early 19th centuries, Singapore was a part of the Sultanate of Johore. During the Malay-Portugal wars in 1613, Singapore was set ablaze by Portuguese troops. 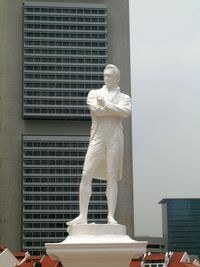 Statue of Thomas Stamford Raffles by Thomas Woolner, erected at the spot where he first landed at Singapore. He is recognised as the founder of modern Singapore. In 1819, Sir Thomas Stamford Raffles, an official with the British East India Company, signed a treaty with the Sultan of Johore. He also established Singapore as a trading post and settlement, which saw instant growth and immigration from various ethnic groups. Singapore was later made a crown colony by Britain in 1867. After a series of colonial territorial expansions, the British Empire soon raised Singapore's status to that of an entrepot town, due to its strategic location along the busy shipping routes connecting Europe to China. During World War II, the Imperial Japanese Army invaded Malaya and the surrounding region in the Battle of Malaya, which culminated in the Battle of Singapore. The British were ill-prepared and swiftly defeated, despite having more troops. They surrendered to the Japanese on 15 February 1942. The Japanese renamed Singapore to Shōnan (昭南), merged from Japanese word Shō ( Shōwa) and nan (South), and occupied it until the British arrived to repossess the island a month after the Japanese surrender in September 1945. Singapore became a self-governing state in 1959 with Yusof bin Ishak as its first Yang di-Pertuan Negara (literally means "head of state" in Malay) and Lee Kuan Yew from the People's Action Party (PAP) as its first Prime Minister, after the 1959 elections. Following the 1962 Merger Referendum of Singapore, Singapore joined Malaysia along with Malaya, Sabah and Sarawak as a state with autonomous powers in September 1963. 16 September, coincidentally, is also Lee Kuan Yew's birthday. 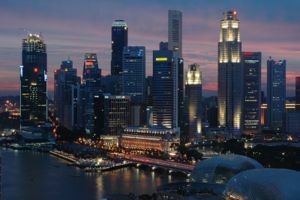 Singapore was expelled from the federation after heated ideological conflict developed between the state government formed by PAP and the federal government in Kuala Lumpur. It gained official sovereignty on 9 August 1965, which later became Singapore's National Day. Malaysia was the first country to recognise it as an independent nation. Yusof bin Ishak was sworn in as the first President of Singapore and Lee Kuan Yew remained as prime minister. The fledgling nation had to become self-sufficient, and faced problems including mass unemployment, housing shortages and lack of land and natural resources such as petroleum. During Lee Kuan Yew's term as prime minister from 1959 to 1990, his administration curbed unemployment, raised the standard of living and implemented a large-scale public housing programme. The country's economic infrastructure was developed, the threat of racial tension was eliminated and an independent national defence system was created. Singapore evolved from a developing nation to a global city with first world status towards the end of the 20th century. In 1990, Goh Chok Tong succeeded Lee as Prime Minister. During his tenure, the country tackled the economic impacts of the 1997 Asian financial crisis and the 2003 SARS outbreak, as well as terrorist threats posed by the Jemaah Islamiah (JI) post-September 11 and the Bali bombings. In 2004 Lee Hsien Loong, the eldest son of Lee Kuan Yew, became the third prime minister. Singapore is a republic with a Westminster system of a unicameral parliamentary government representing different constituencies of Singapore. The bulk of the executive powers rests in the hands of the Cabinet of Singapore, which consists of ministers led by the Prime Minister of Singapore. 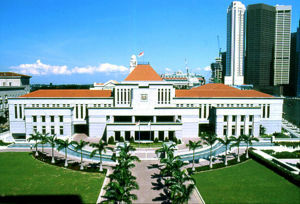 The office of the President of Singapore was, historically, a ceremonial one as head of state, but the Constitution of Singapore was amended in 1991 to create the position of a popularly elected President and also to grant the President veto powers in a few key decisions such as the use of the national reserves and the appointment of key judiciary positions. The legislative branch of government is the Parliament. Parliamentary elections in Singapore are plurality-based for group representation constituencies since the Parliamentary Elections Act was modified in 1991. Singaporean politics have been dominated by the People's Action Party (PAP) since the country's independence in 1965. Foreign political analysts and several opposition parties including the Workers' Party of Singapore, the Singapore Democratic Party (SDP) and the Singapore Democratic Alliance (SDA)have argued that Singapore is a de facto one-party state. Many consider the form of government in Singapore to be closer to authoritarianism such as illiberal democracy or procedural democracy rather than true democracy. Reporters Without Borders ranked Singapore 140th out of 167 countries in its 2005 Worldwide Press Freedom Index. It has also been alleged that the PAP employs censorship, gerrymandering by the Elections Department and the filing of civil suits against the opposition for libel or slander to impede their success. Several former and present members of the opposition, including Francis Seow, J.B. Jeyaretnam and Chee Soon Juan perceive the Singaporean courts as favourable towards the government and the PAP due to a lack of separation of powers. Although no PAP member has ever lost a defamation case in court, there are three cases in which opposition leader Chiam See Tong sued PAP members for defamation and successfully obtained an out-of-court settlement. Singapore has what its government considers to be a highly successful and transparent market economy. The PAP's policies contain some aspects of socialism. The Housing Development Board oversees a large-scale public housing programme and education in Singapore is a rigorous compulsory public education system, and government-controlled companies are dominant in the local economy. Although dominant in its activities, the government has a clean, corruption-free image. Singapore has consistently been rated as the least-corrupt country in Asia and amongst the top ten cleanest from corruption in the world by Transparency International. Although Singapore's laws are inherited from British and British Indian laws, including many elements of English common law, the PAP has also consistently rejected liberal democratic values, which it typifies as Western and states that there should not be a 'one-size-fits-all' solution to a democracy. Laws restricting the freedom of speech are justified by claims that they are intended to prohibit speech that may breed ill will or cause disharmony within Singapore's multiracial, multi-religious society. For example, in September 2005, three bloggers were convicted of sedition for posting racist remarks targeting minorities. Some offences can lead to heavy fines or caning and there are laws which allow capital punishment in Singapore for first-degree murder and drug trafficking. Amnesty International has criticised Singapore for having "possibly the highest execution rate in the world" per capita. The Singapore government argued that there is no international consensus on the appropriateness of the death penalty and that Singapore has the sovereign right to determine its own judicial system and impose capital punishment for the most serious crimes. However, despite restrictions on public gatherings in Singapore, a small group of activists has organised events in 2005 and 2006 protesting against the country's use of the death penalty. More recently the PAP government has relaxed some of its socially conservative policies and created a "Feedback Unit" to encourage citizens to share their views on policies and public services. Singapore is divided into 55 urban planning areas, grouped into 5 regions. Singapore Botanic Gardens, a 67.3-hectare (166 acre) botanical garden in Singapore that includes the National Orchid Garden which has a collection of more than 3,000 species of orchids. Singapore consists of 63 islands, including the main island itself. There are two connections from Singapore to the Malaysian state of Johor — a man-made causeway known as the Johor-Singapore Causeway to the north, crossing the Tebrau Straits, and Tuas Second Link, a bridge in the western part of Singapore that connects to Johor. Jurong Island, Pulau Tekong, Pulau Ubin and Sentosa are the largest of Singapore's many smaller islands. The highest point of Singapore is Bukit Timah Hill, with a height of 166 metres (538 ft). 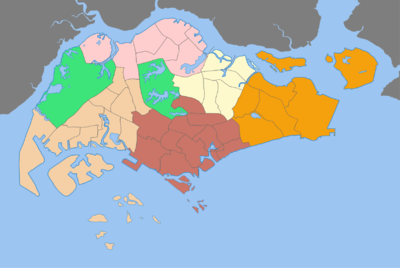 The urban area used to be only concentrated on the southern part of Singapore around the mouth of the Singapore River and what is now the Downtown Core, while the rest of the land was tropical rainforest or used for agriculture. Since the 1960s, the government has constructed new towns in outlying areas, resulting in an entirely built-up and urban landscape, although the Central Area, the central business district, remains the densest. The Urban Redevelopment Authority is a government agency responsible for the urban planning of Singapore that concentrates on efficient land use and distribution, as well as transport flow. It has released a Development Guide Plan which details specific land use for each the 55 urban planning areas of Singapore. Singapore has reclaimed land with earth obtained from its own hills, the seabed and neighbouring countries. As a result, Singapore's land area grew from 581.5 square kilometres (224.5 sq mi) in the 1960s to 697.2 square kilometres (269.1 sq mi) today, and may grow by another 100 square kilometres (38.6 sq mi) by 2030. About 23% of Singapore's land area consists of forest and nature reserves. Singapore has a tropical rainforest climate with no distinct seasons, under the Köppen climate classification. Its climate is characterised by uniform temperature and pressure, high humidity and abundant rainfall. Temperatures range from 22° C to 34 °C (72°–93° F). On average, the relative humidity is around 90% in the morning and 60% in the afternoon. During prolonged heavy rain, relative humidity often reaches 100%. The lowest and highest temperature recorded in its maritime history is 18.4 °C (65.1 °F) and 37.8 °C (100.0 °F) respectively. The highest wind speed recorded is 120km/h on July 27, 2001 . Urbanisation has eliminated many areas of primary rainforest that once existed, with the only remaining area of primary rainforest being Bukit Timah Nature Reserve. 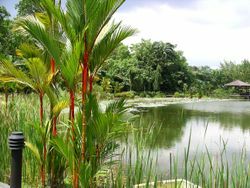 A variety of parks, however, are maintained with human intervention, such as the Singapore Botanic Gardens. Without natural freshwater rivers and lakes, the primary domestic source of water supply in Singapore is rainfall, collected in reservoirs or catchment areas. Rainfall supplies approximately 50% of Singapore's water; the remainder is imported from Malaysia or obtained from recycled water facilities, a product called NEWater and desalination plants. More NEWater and desalination plants are being built or proposed to reduce reliance on foreign supply. Singapore's Central Business District (CBD), where there is the fourth largest exchange centre in the world. The piece of green land facing the CBD would be half the site of the future Integrated Resort. Singapore's national icon, the Merlion can be seen in the CBD and Sentosa. Orchard Road is a popular tourist attraction in Singapore. 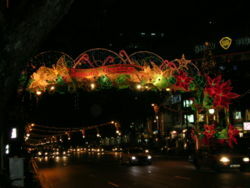 Every year, Orchard Road is brightly lit during Christmas, so that tourists can enjoy the night scene of the streets every night during this period of time. Singapore has a highly developed market-based economy, and is a developed nation. It ranks 25th on the Human Development Index which measures standards of living, and second in the Index of Economic Freedom. Singapore's gross domestic product (GDP), per capita, is equal to that of the major European countries. Singapore is also the fourth largest foreign exchange trading centre in the world after London, New York City and Tokyo. Singapore has been rated as the most business-friendly economy in the world. According to a World Bank-IFC report, Singapore beat previous winner New Zealand for the top spot in the 2005/2006 rankings, while the United States came in third. Within Asia, Hong Kong was Singapore's closest competitor, in fifth place. The economies were evaluated on 10 key parameters that included the ease of starting a business, getting licences, sourcing staff, and enforcing contracts. The city-state also employs thousands of foreign workers from around the world. It requires talent from outside to fill the various jobs the economy is generating, most of which are in the IT and financial sectors. The variety of workers predominantly hired are local Singaporeans, Indians, Malaysians and Filipinos. The government is aggressively pushing for the permanent assimilation of these foreign workers by offering easier processing time for permanent residency or citizenship. The economy depends heavily on exports produced from refining imported goods in a form of extended entrepot trade, especially in manufacturing. Manufacturing contributes around 28% to GDP in 2005. The manufacturing industry is today well-diversified with electronics, chemicals, mechanical engineering and biomedical sciences manufacturing. Along with Hong Kong, South Korea and Taiwan, Singapore's fast-paced industrialization earned it a place as one of the four original ' East Asian Tigers'. In 2001, a global recession and slump in the technology sector caused the GDP to contract by 2.2%. The Economic Review Committee (ERC), set up in December 2001, recommended several policy changes with a view to revitalising the economy. 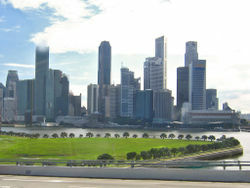 Singapore has since recovered from the recession, largely due to improvements in the world economy; the Singaporean economy itself grew by 8.3% in 2004 and 6.4% in 2005. In the long term, the government hopes to establish a new growth path which will be less vulnerable to the external business cycle, as compared to the current export-led model. However, the government is unlikely to abandon efforts to establish Singapore as Southeast Asia's financial and high-tech hub. The per capita GDP in 2005 was US$26,833 and the unemployment rate was 2.7% in October 2006, down from 2.8% in June the same year. 81,500 new jobs were created from January-July 2006, the highest number in a decade within a 6 month period. The economy is expected to grow by 7.5% to 8% in the year 2006 as announced by the Singapore government on 20 November 2006, after a strong 9.4% growth in the first half of Year 2006 (Jan-Jul 2006), and a 7.2% growth in the third quarter of 2006. Initially, Lee Hsien Loong, who is the current Finance and Prime Minister, had only expected growth to be between 3-5% for the whole year. On 5 October 2006, the government announced that Singapore has recorded its highest employment rate in 15 years with improvements, particularly, in the hiring of older workers. The Manpower Ministry's Research and Statistics Department said that in June this year, 76 percent of its resident population, aged 25 to 64, were employed. This was up from 73 percent last year and 72 percent in 2004. Singapore introduced a Goods and Services Tax (GST) with an initial rate of 3% on 1 April 1994. This has substantially increased government revenue by $1.6 billion, stabilising the government's finances. The government has used revenue from the GST to reorient the economy around services and value added-goods to reduce dependence on electronics manufacturing. The taxable GST was increased to 4% in 2003 and to 5% in 2004. The GST could be increased to 7% in Year 2007. Singapore is a popular travel destination, making tourism one of its largest industries. In 2005, a total of 9.05 million tourists visited Singapore . By 2015, Singapore hopes to achieve about 17 million visitor arrivals . In July 2006, a record high of a total of 913,000 visitors arrived in Singapore, mostly due to the Great Singapore Sale . The Orchard Road district, which is dominated by multi-storey shopping centres and hotels, is the centre of tourism in Singapore. Other popular tourist attractions include the Singapore Zoo and its Night Safari along with the tourist island of Sentosa. To attract more tourists, the government decided in 2005 to legalise gambling and to allow two Integrated Resorts to be developed at Marina South and Sentosa. Other than the Integrated Resort, many other new developments are coming up that includes the Singapore Flyer and Gardens by the Bay. Cuisine has been heavily promoted as an attraction for tourists, and is usually promoted by various initiatives undertaken by the Singapore Tourism Board or the associations it deals with as one of Singapore's best attractions alongside shopping. The government organises the Singapore Food Festival in July annually to celebrate Singapore's cuisine. The multiculturalism of local food, the ready availability of international cuisine, and their wide range in prices to fit all budgets at all times of the day and year helps create a "food paradise" to rival other contenders claiming the same moniker. 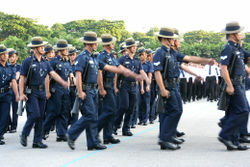 The Gurkha Contingent of the Singapore Police Force, with its members recruited from Nepal, is a counter-terrorist force in the country. Here, the officers join local officers in the annual Police Day Parade. The military of Singapore serves primarily as a deterrent to potential invaders of the island. Singapore has mutual defence pacts with several countries, most notably the Five Power Defence Arrangements. Singapore subscribes to a philosophy of Total Defence, in which five aspects of a holistic national defence are identified. Non-military aspects of total defence include civil defence, which is carried out by the Singapore Civil Defence Force; 'economic defence', which stresses the need for a robust economy in order to maintain a viable society; 'psychological defence', which calls for a patriotic citizenry willing to do all in the name of its country; and 'social defence', in which the need for a population at harmony with itself and strongly identified with each other is emphasised. The military of Singapore includes the Singapore Army, the Republic of Singapore Navy, and the Republic of Singapore Air Force, collectively known as the Singapore Armed Forces (SAF). Various agencies of the Ministry of Defence (MINDEF) and some private companies also play a supporting role. The military of Singapore is one of the most modern in Asia, with its advanced equipment and high level of training reflecting the continued emphasis of the government on military defence — military expenditures dominate the annual government budget. The recent rise in unconventional warfare and terrorism has cast increasing emphasis upon the non-military aspects of Total Defence. The Gurkha Contingent, which is part of the Singapore Police Force, is also a counter-terrorist force. Singapore's defence resources have been used in international humanitarian aid missions, including United Nations peacekeeping assignments in Kosovo, Kuwait and East Timor, and participating in the multinational force in Iraq. One notable incident of terrorism in Singapore prior to its independence was the bombing of MacDonald House during the Confrontation that took place between Malaysia and Indonesia in the early 1960s. More recently, the Shell Oil refinery on Bukom was attacked by members of the Japanese Red Army and the PFLP in the Laju Incident of 1974; and in 1991, the hijacking of Singapore Airlines Flight 117 ended in the storming of the aircraft and the subsequent deaths of all four hijackers. A current concern is Jemaah Islamiyah, a militant Islamic group operating in South East Asia known to be responsible for several bombings around the region, as well as planning in 2001 an ultimately foiled attack on American interests in Singapore. The architecture of Singapore is extremely varied. Due to the lack of available space, few historical buildings remain in the urban areas of Singapore. However, Singapore has become a centre for modern architecture as older buildings are cleared away to make space for newer, larger buildings. Historically, the demand for high-end buildings has been in and around the Central Business District (CBD). After decades of development, the CBD has become an area with many tall business buildings. These buildings comprise the skyline along the coast of Marina Bay and Raffles Place, which is a famous tourist attraction in Singapore. Due to the air restrictions in Singapore, no building in Singapore is to be taller than 280 metres. The three tallest buildings in Singapore, namely Republic Plaza, UOB Plaza One and OUB Centre, are all 280 metres in height. A few signs of Singapore's colonial past remain in the form of "Black and White Houses". These large houses are situated further away from the CBD and were built in the early to mid 19th century. These homes were built to house the British generals and governers when Britain occupied the country. Later, they became home to many Japanese generals after the "fall of Singapore" during World War II. Built in 1843, the Sri Mariamman Temple is the largest Hindu temple in Singapore. It is also one of the many religious buildings marked as national monuments for their historical value. Singapore is the second most densely populated independent country in the world, excluding Macau and Hong Kong which are parts of the PRC. 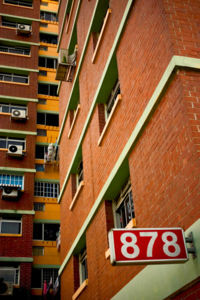 Eighty-four percent of Singaporeans live in public housing provided by the Housing and Development Board (HDB). The largest group in the population of 4.35 million (as of June 2005) are the Singaporean Chinese who account for 76.8% of Singaporeans, making it one of the largest Chinese cities outside of China. Nearby Malaysia is also home to many ethnic Chinese. Singapore is also diverse, with the Singaporean Malays, who are the indigenous native group of the country, constituting 13.9%, though this number includes many Malay ethnic groups from other parts of the Malay archipelago including the Javanese, Bugis, Baweans and Minangkabau. Indian Singaporeans are the third largest ethnic group at 7.9%, consisting of several groups — Indian Tamils and Sri Lankan Tamils, who form the largest Indian group, and others such as Malayalees, Punjabis and Bengalis. The rest are made up of smaller groups such as Arab Singaporeans, Jews, Thais, Japanese, European and the Eurasian Singaporean community. Singapore is also a multi-religious country, due mainly to its location on one of the world's major transportation routes. More than 40% of Singaporeans practice Buddhism. About 15% practice Christianity (mostly Chinese and Indians), and 15% profess no religion. Muslims (mostly Malays) account for 14%. A smaller minority practices Taoism, Sikhism, Hinduism, Baha'i Faith, and others. The government of Singapore has been careful to maintain ethnic harmony after racial riots erupted in the 1960s. Racial harmony has been emphasized in all aspects of society, including the Singaporean education system, military and housing. So far the policy has been largely successful, and there have been few signs of ethnic tension since the early 1970s. Current issues include the ban on wearing the Islamic headscarf in public schools. The national language of Singapore is Malay for historical reasons, and it is used in the national anthem, " Majulah Singapura". The official languages are English, Mandarin, Malay and Tamil. English has been promoted as the country's language of administration since independence, and it is spoken by the majority of the population. Most public signs and official publication are in English although there are also translated versions in the other official languages. The government has introduced a Speak Mandarin Campaign- Hua Yu Cool - to promote Mandarin as a common language among the Chinese. After two decades of a successful family planning policy, Singapore is now facing the threat of an aging population with declining birth rates. The government is encouraging Singaporeans to have more children through the provision of financial incentives for the first to fourth child of each family. Enjoying Singaporean cuisine is a national pastime. Hawker centres and kopi tiams are well-distributed throughout the country. The majority of Singaporeans live in planned estates of high-rise, high-density HDB flats. Singapore is a small and relatively modern amalgam of an indigenous Malay population with a third generation Chinese majority, as well as Indian and Arab immigrants with some intermarriages. There also exist Eurasian and Peranakan (known also as 'Straits Chinese') communities. Singapore has also achieved a significant degree of cultural diffusion with its unique combination of these ethnic groups, and this has given Singapore a rich mixture of diversity for its young age. 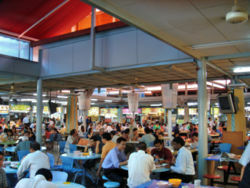 One of the prime examples is in Singaporean cuisine, often a cultural attraction for tourists. The English used is primarily British English, with some American English influences. The local colloquial dialect of English is Singlish, which has many creole-like characteristics, having incorporated vocabulary and grammar from various Chinese dialects, Malay, and Indian languages. Singlish is spoken commonly on the streets, but the government frowns upon its use in official contexts. English became widespread in Singapore after it was implemented as a first language medium in the education system, and English is the most common language in Singaporean literature. 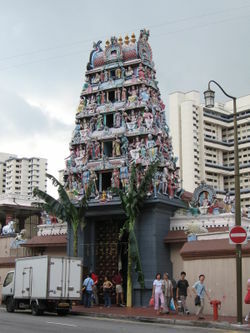 Singapore has several ethnic neighbourhoods, including Little India and Chinatown. These were formed under the Raffles Plan to originally segregate the immigrants, but now have a diverse patronage whose main intentions are to either eat or buy something specific to that culture. Many places of worship were also constructed during the colonial era, a practice encouraged by the British to promote religious tolerance. Sri Mariamman Temple, the Masjid Jamae Mosque and the Church of Gregory the Illuminator are among those that were built during the colonial period. Work is now underway to preserve these religious sites as National Monuments of Singapore. The policy for the primarily commercial ethnic neighbourhoods stands in contrast to the housing policies of the Housing and Development Board (HDB). HDB policies attempt to promote a mix of all races within each housing district in order to foster social cohesion and national loyalty. Since the 1990s, the government has been striving to promote Singapore as a centre for arts and culture, including theatre and music, and to transform the country into a cosmopolitan and diverse community at the 'gateway between the East and West'. The highlight of these efforts was the construction of Esplanade - Theatres on the Bay, a centre for performing arts that opened on October 12, 2002. Students having assembly in the hall of a Singapore secondary school. Primary education is compulsory in Singapore and as such the literacy rate is 95%. The standard for the school curriculum is set by the Ministry of Education with a mix of private schools and public schools. There is no strict public-private dichotomy: the degree of autonomy in regard to the curriculum and student admission, government funding received, and tuition burden upon the students is determined by a more specific classification system that includes classifications such as "government-run", "government-aided", "autonomous", "independent", and "privately-funded". Some schools have more than one classification. In addition, there are international schools catered to expatriate students, though they have some local students. After primary education, students take the Primary School Leaving Examination (PSLE). Their performance in the examination is the main criteria in determining whether they enter their desired secondary schools. There have also been complaints about excessive educational streaming at a young age; a popular local film, I Not Stupid, highlights the competitiveness of the system and social stigma that students struggling with studies have to face. After secondary education, a further set of examinations are taken which determine which kind of tertiary education they pursue, such as junior college, a precursor for entry into public universities such as National University of Singapore, Nanyang Technological University and Singapore Management University. Other post-secondary institutions include polytechnics, where students will graduate with a diploma and may choose to move into the workforce or pursue higher education in public universities such as those mentioned above. The polytechnics include Temasek Polytechnic, Singapore Polytechnic, Ngee Ann Polytechnic, Nanyang Polytechnic and Republic Polytechnic. Other institutes include a teaching college to train teachers, various management institutes, and vocational education institutes such as the Institute of Technical Education (ITE). Singapore students took first place in the 1995, 1999 and 2003 TIMSS Trends in International Mathematics and Science Study. They used Singapore Math Primary Mathematics series. The national textbooks have been adapted into a series which has been successfully marketed in North America as a rival to Saxon math and an alternative to controversial standards-based mathematics curricula which many parents complained moved too far away from the sort of traditional basic skills instruction exemplified by Singapore's national curriculum. A C751B train at Eunos MRT Station on the Mass Rapid Transit (MRT) system, one of three heavy rail passenger transport lines in Singapore. Singapore's Changi International Airport is one of the largest aviation facilities in Asia, serving 179 cities in 57 countries. Singapore is a major Asian transportation hub, strategically lying on sea and air trade routes. Its history has been closely tied to the growth of its transportation industry since the establishment of its port. The transportation industry comprises over 10% of Singaporean GDP despite an increasingly diversified economy. The Port of Singapore, managed by port operators PSA International and Jurong Port, was the world's busiest port in 2005 in terms of shipping tonnage handled with 1.15 billion gross tons handled, and in terms of containerised traffic, with 23.2 million Twenty-foot equivalent units (TEUs) handled. It was also the world's second busiest in terms of cargo tonnage, coming behind Shanghai with 423 million tons handled. In addition, Singapore is the world's busiest hub for transhipment traffic and the world's biggest ship refuelling hub. Singapore is an aviation hub, acting as a stopover point for the ' Kangaroo route' between Australasia and Europe. 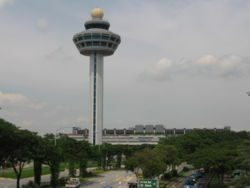 Singapore Changi Airport has a network of 81 airlines connecting Singapore to 179 cities in 57 countries (2005). It is one of the top five airports in Asia in terms of passengers handled, with 30 million passengers passing through in 2004. It has been consistently rated as one of the best international airports by numerous international travel magazines. It was also rated as the world's best airport in 2006 by Skytrax, defeating its long time rival, Hong Kong International Airport. A low-cost terminal, the Budget Terminal, which started operation in March 2006 and a third passenger terminal now under construction will increase the airport's total annual capacity to 66.7 million passengers by 2008. The national carrier Singapore Airlines (SIA) is internationally renowned for its service and will be the first airline in the world to fly the new Airbus A380 commercially. The backbone of domestic transport infrastructure is the road transport system which includes a network of expressways that form the arteries between distinct towns and regional centres as laid out in Singapore's urban planning. Following a government study assisted by the United Nations Development Programme which foresaw problems with private transport such as traffic congestion and air pollution as the city grew, the Land Transport Authority began a series of measures to develop the use of the public transport system such as improving the nation's bus service and liberalising the hired vehicle market to allow for more taxi operators. Since 1987, the heavy rail passenger Mass Rapid Transit (MRT) metro system has been in operation. 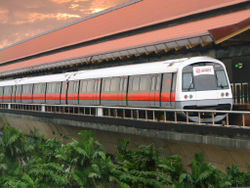 MRT was later augmented by and linked to the Light Rapid Transit (LRT) light rail system, which provides service to several expanses of housing estates. The EZ-Link system allows contactless smartcards to serve as stored value tickets for use in the public transport systems. More than 2.8 million people use the bus network daily, while more than 1.3 million people use either the LRT or MRT as part of their daily routine. Approximately 900,000 people use the taxi services daily. Private vehicle use in the Central Area is discouraged by tolls implemented through an Electronic Road Pricing system which operates during hours of heavy road traffic.